What a great day--it's chocolate day! Or at least one of them--I have found several other dates that claim to be chocolate day. I guess since it is such a great day, more than one is necessary! 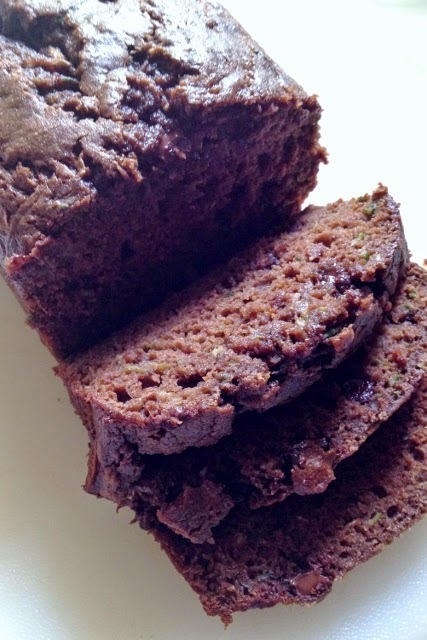 In celebration, we baked up a batch of Chocolate Zucchini Bread. I am not really sure where I got this recipe, but it is so delicious and moist. You won't even know there is zucchini in it! Since there is no oil and some whole wheat flour, it is healthier than other recipes. Pre-heat oven to 350°. Beat eggs, sugar, applesauce and vanilla in a large bowl. Combine flour, cocoa, salt, baking soda, baking powder and cinnamon. Gradually add to sugar mixture and mix until well blended. Stir in zucchini. Add chocolate chips. Bake in two 8" x 4" greased pans for 45-50 minutes. This is for sure a Happy Chocolate Day recipe, thank you!